I added an option in v0.0.4 to have a minimum sell price. When I have more time I will allow you to do this per item, as well as set ceiling and floor prices for buy and sell. And since /buy and /sell conflict with the most commonly installed plugin, if a default was done, it would make sense to default to /advsell and /advbuy not the other way around. I strongly recommend using /buy and /sell instead and simply include instructions for people with conflicting plugins that you can change these commands yourself using WinRAR editing of the jar and editing plugins.yml. Many players are not good at reading or understanding instructions and they need commands to be what they are used to and as simple as possible. Unfortunately the WinRAR method seems incompatible with AdvShop for some reason, so I'll have to stay on version 0.0.1 until you change the commands back to /sell and /buy or offer an option to switch in the config. Ok, I must be doing something wrong here, how do I change the prices, because a diamond sword cannot cost or sell for the same price as a torch. Everything else I like. plz add a buy/sell sign so that i can get rid of chest shop! I do understand how it works. I'm aware that the stock dictates the pricing scheme. This was not what I was getting at though. At the moment, you're the only one with a plugin close to what the old DynamicEconomy plugin does. That plugin was able to do everything I had needed it to back before it had stopped being maintained by the dev. Your plugin though is a lot more simple and I thank you for the stock addition. I wanted to be able to affect the pricing via stock and if possible, the pricing. Now this does that so for now, I'm quite happy with it. @AegisZephyr It seems like you don't really understand how the plugin works. Regardless I added a command in v0.0.3 for setting the bought and sold stock. The plugin however works on a formula to get the buy/sell value. The price doesn't simply drop or rise a fixed amount per transaction. As for stock, it has a bought/sold amount, however by default this is defined over a period of time so changing the stock will interfere with this. @DivinityCraft I can't seem to replicate the bug with items only be sellable in the hotbar. As for enchantments, I am still unsure how this would work and look in the idlist.yml as enchantments are meta data rather than damage. Love your plugin so far and it works now as intended. I have another request that I'm not sure if you're up to or not. 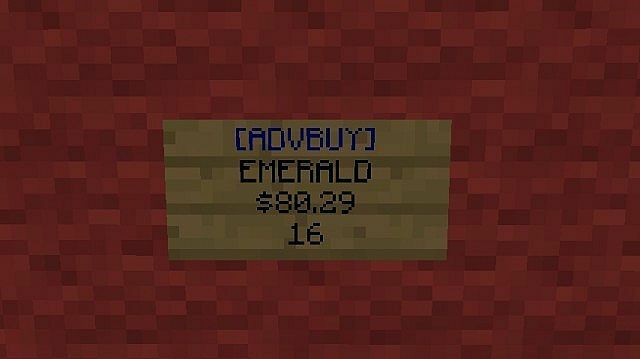 I'd like to be able to use command blocks to trigger events with this plugin by allowing a command block to make a price rise or fall. This would have to at least be usable via console as command blocks only output console commands. Something like the following could be good to start when you add pricing to the plugin. My server has used 3 different global market plugins since we started 2011 and now we have finally found a good replacement for the ever more bloated and clunky Hyperconomy. The way you have combined simplicity and ease of management with giving us admins full control of the pricing method makes this plugin superior to any other global market I've seen over the years. I'll be keeping in touch to give advise on how to perfect it. We have a bug where using the /sell command makes only items in your hotbar get sold, not in the rest of the inventory. While trading enchantments the way Hyperconomy does is not a good solution, perhaps having enchantment books be trade-able would work? A /sellall command would be very handy, it would simply sell everything tradeable that you carry (preferably not armor if that can be avoided). Sure, I'll add that. I'm not sure why I didn't do that in the first place. Not sure if you're active or not but I do have a request. Using /buy currently conflicts with our buycraft command. Is there a way you can change the /buy and /sell commands to /advbuy and /advsell? This would more than likely increase compatibility with other plugins that may be using similiar commands.